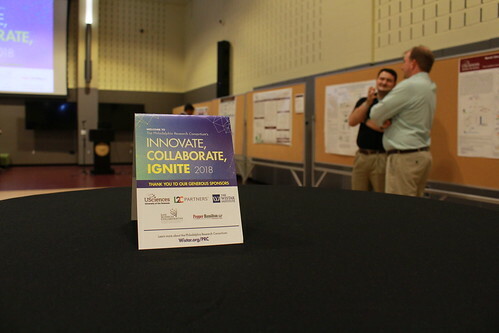 Greater Philadelphia continues to earn stature as a center of innovation and leader in the life sciences with the region’s assets on full display at Innovate, Collaborate, Ignite 2018!, the first meeting of the Philadelphia Research Consortium (PRC), held Oct. 2, 2018, at University of the Sciences. The shared goals of the 150+ attendees – USciences and its Consortium colleagues, and our start-up, biotech/pharmaceutical, investor and other life sciences community members – were to foster the kinds of academic-biotech-investor relationships needed to move innovative, early-stage discoveries from the laboratory to the marketplace. Launched in the spring of 2017, the PRC comprises 13 academic research institutions across the region. The Consortium enables local, national and international start-up and biotech partners to leverage the collective research strengths of Greater Philadelphia’s life sciences community. To facilitate efficient technology transfer from the lab bench to the marketplace, all PRC members have agreed to using a universal, sponsored research agreement template with start-up and biotech research partners that are interested in engaging in the research community. The universal agreement has already streamlined several fruitful research collaborations among PRC members, said Heather Steinman, PhD, MBA, vice president of business development and executive director of technology transfer for The Wistar Institute, a PRC founding member. PRC members, including The Monell Chemical Senses Center, Children’s Hospital of Philadelphia, Drexel University, Temple University, the Lankenau Institute for Medical Research, Thomas Jefferson University, Penn State College of Medicine, Penn State University, Lehigh University, The Wistar Institute, and USciences presented their research core facilities and pre-clinical discoveries and inventions, ranging from a small molecule that selectively targets triple negative breast cancer cells, to a new yeast species that quickly ferments a pleasant, aromatic beer in half the standard time. Innovate, Collaborate, Ignite 2018! was made possible through the generous support of sponsors including the University of the Sciences, The Wistar Institute, L2C Partners, Life Sciences Collaborative and Pepper Hamilton, as well as 1776, Cambridge Innovation Center, University Place Associates, Ben Franklin Technology Partners, MercaChem, Calvert Labs, Rockland Immunochemicals, GE, and Active Motif.